... and G.C. 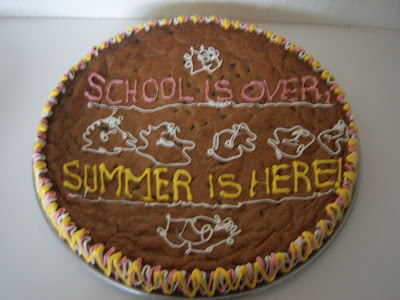 is for GIANT COOKIE! What do you do when the class party is tomorrow, you don't have a lot of time, and you want to maintain your rep as the mom who sends the cool treats to school? You make a GIANT COOKIE! All you do is bake your favorite Chocolate Chip Cookie recipe in a 12" round cake pan. If you don't make wedding cakes you may not have a 12" round, in that case just use your biggest springform pan or two 8" rounds. 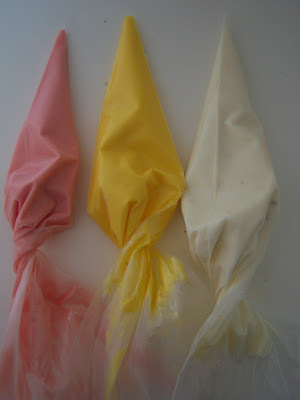 Luckily, I had Wilton Candy Melts left over from the CakePops project all ready to go in pastry bags, so it was super easy to re-melt them and decorate the top and sides. Max told me exactly what to write and where to write it. The kid must have learned something this year because he insisted on correct punctuation as well. GIANT COOKIE is great for show-offs like me, because it's so much easier to make than dozens of regular cookies, but makes such a big impression when you parade it around the party.